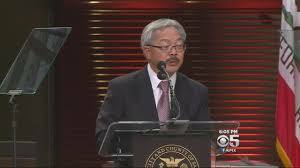 In a room at City Hall with extra security and full of social justice activists looking on, Ed Lee the mayor of San Francisco listened to a barrage of questions from the city’s board of supervisors, who were demanding new police reforms. This comes after a study by the district attorney’s Blue Ribbon Panel, revealed major racial bias by SF police and lack of oversight within the department. As a result of the outcry for police reform in the city, due to incidents of police violence and brutality , including the shooting of unarmed Alex Nieto, a case that went on trial a couple months ago. Ed Lee claimed he would would allocate over 17 million dollars to police reforms and violence prevention in his new two-year budget, which he is scheduled to submit to the board of supervisors by the first of June, for review. THE FIRING OF SAN FRANCISCO POLICE CHIEF GREG SUHR.